Sometimes the best dinners are the simplest. We can be quick to dismiss chicken as boring and plain but it’s one of those things that when cooked well can be truly absolutely delicious. 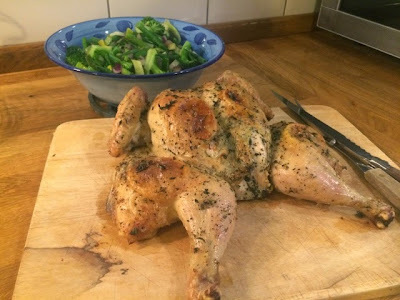 A good roast chicken reminds us all of Sunday dinners cooked by our Mum/Nan and you forget how much you love it until the next time someone cooks you a really good roast chicken. 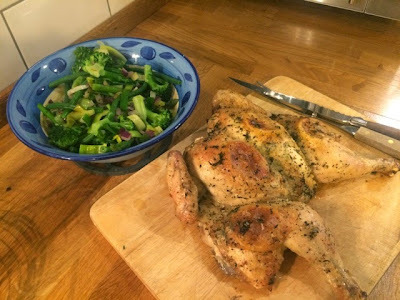 I wasn’t doing the full Sunday Roast works when I cooked this chicken at the weekend, this was Saturday night dinner and to keep it light I simply served it with a big pile of tasty spring vegetables. 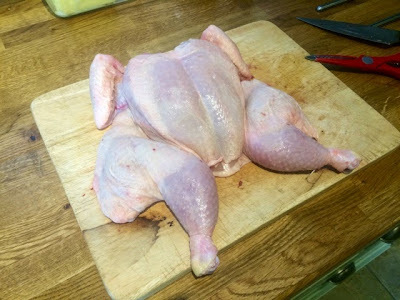 I chose to spatchcock my chicken as it helps to cook a little more evenly and keep the whole chicken quite juicy with crispy skin all over. 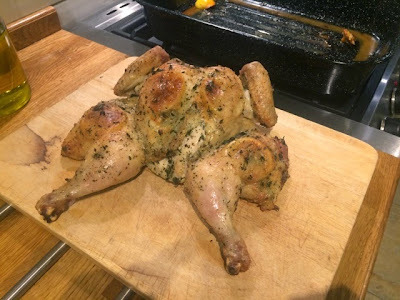 Now, I’m not going to advise you on how to spatchcock a chicken as this was my first attempt and I am absolutely not an expert at it. What I will do is guide you to a couple of videos that I watched before I did it: the first from Sorted as I find their recipe videos really simple and foolproof to follow, and the second from the BBC food website. Both do it slightly differently but I’d suggest you watch a few and then do what you find easiest for you. It’s not quite as easy as they make it look but it’s not that complicated and I managed to do it without any dramas. Now that you’ve got your head round preparing your chicken, there are a million different things you could do with it. 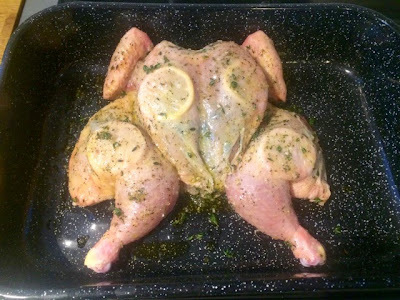 I went for a simple (but seriously tasty) lemon, garlic and herb marinade this time but now I’ve mastered the ‘art of spatchcocking’ there’s a few other things I’d like to try. I think this would work brilliantly with The Boyfriend’s jerk recipe, I’d also love to give a curry marinade a go. 2. Spatchcock your chicken (see video references above). 3. 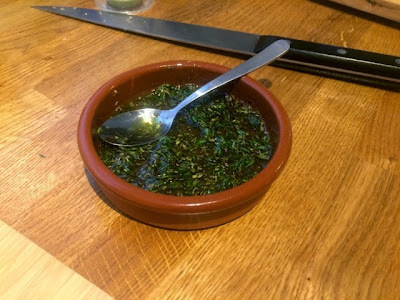 Mix together the herbs, olive oil and salt and pepper for the chicken marinade. 4. Rub the garlic into the chicken getting as much under the skin as possible. 5. Slide four slices of lemon under the skin, one on each breast and one on each leg. 6. Pour over the oil and herb mixture, rubbing it all over the chicken and getting a good amount under the skin still. 7. Roast in the oven for 45-60 minutes until cooked through and the skin is crisp and golden. 8. 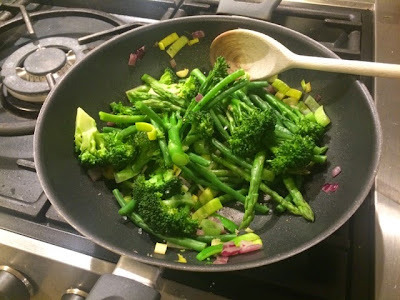 When the chicken is nearly done put the asparagus, beans and broccoli into a saucepan and only fill with water to half the level that the vegetables reach. Place on a high heat with the lid on to steam for about 7 minutes. 9. Sautée the leeks and red onions until softened. 10. Drain the steamed veg and mix together with the sautéed veg. Season with salt and pepper. 11. Remove the chicken from the oven and allow to rest on a board while you’re dishing up the veggies. 12. Serve on the board to carve at the table with the vegetables in one big dish for everybody to help themselves.